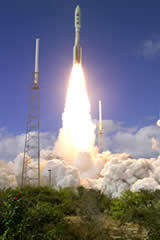 New Horizons will re-enter hibernation on Jan. 17 – nearly eight years to the day after the spacecraft's launch from Cape Canaveral Air Force Station, Fla., on Jan. 19, 2006. Since then it has covered more than two billion miles; spied a small asteroid; flew past and studied the solar system's largest planet; and collected unprecedented data on the space dust environment of the outer solar system. And New Horizons is still 18 months from reaching its main target! With Pluto encounter operations now just a year away, the New Horizons team has brought the spacecraft out of hibernation for the first of several activities planned for 2014. Mission operators at the Johns Hopkins Applied Physics Lab in Laurel, Md., “woke” New Horizons on Jan. 5. Over the next two weeks the team will test the spacecraft’s antenna and repoint it toward Earth; upload commands into the onboard Guidance and Control and Command and Data Handling systems, including a check on the backup inertial measurement unit and update of the spacecraft’s navigational star charts; and conduct some navigational tracking, among other routine maintenance duties. “We’ve had busier wakeup periods, but with long-distance Pluto encounter operations starting only a year from now, every activity is important,” says APL’s Alice Bowman, New Horizons mission operations manager. The pace of operations picks up significantly later this year. In late June the team will wake New Horizons for two and a half months of work, including optical-navigation (“homing”) activities using the Long-Range Reconnaissance Imager (LORRI) to refine the probe’s course to Pluto. The team will also check out the spacecraft’s backup systems and science instruments; carry out a small course correction to trim up New Horizons’ approach trajectory and closest-approach timing at Pluto; and gather some science data by measuring the variations in Pluto’s and Charon’s brightness as they rotate. New Horizons is placed back into electronic slumber on Aug. 29, a “rest” that lasts only until Dec. 7. “From there it will stay awake for two years of Pluto encounter preparations, operations and data downlinks,” Bowman says. Distant-encounter operations begin Jan. 12, 2015.